See if you can catch the mail reference in this timely piece of mail music. It's not as overt as usual but it's there and it's not really that big a stretch to make this the perfect choice for today's Mail Music Monday. Pay no attention to the dates referenced as it seems that this was written a while back as a contest or campaign to end Daylight Saving Time. I actually like having more daylight hours at the end of my day, but is anyone else missing that hour we lost? My head isn't the only thing confused by this time change, a few of my clocks are also confused. I have an old alarm clock that I have to set every Daylight Saving Time, or as it's commonly called, “Daylight Savings Time”. I have an oldish alarm clock that used to set itself to the correct time — that is until they started messing with the dates that we Spring Forward and Fall Back. That one and my programmable thermostat will take a week or so to get themselves back on track. I say “get themselves back on track” because if I change them now, they'll change themselves and be wrong again a week or two from now. The first thing I do is set the clock on the programmable coffee maker. Now, please excuse me, I need another cup. On March 2, Texas celebrates three things; Texas Independence Day, Sam Houston’s birthday and Texas Flag Day. Texas Independence Day is an official state holiday while the latter two events are commemorated on the same day. Commemorative U.S.P.S. 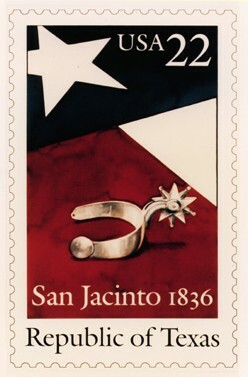 postage stamp, honoring the Texas Sesquicentennial, in 1986, designed by Don Adair. It was on March 2, 1836, that Texas formally declared its independence from Mexico. This was after the capture of the Alamo (remember that?) and before the Battle of San Jacinto when commander-in-chief, Sam Houston led his troops to victory against Mexican forces. Shortly after the battle, Mexico’s General Santa Anna was captured and negotiations began and finally led to Texas’ independence. I was planning to post this much earlier in the day, but in my research I kept finding more and more interesting things about how we came to celebrate this day. I come from a long line of history buffs and I have Cherokee ancestery, so once I got started, I it was hard to stop. My mom was a history teacher who got her master’s degree in Native American history. My dad has citizenship in the Cherokee Nation. These things contributed to my special interest in Sam Houston. He is one of my favorite Texans. He lived with the Cherokees and was an ambassador for Native American rights. He had slaves but there were many indications that he did not believe in slavery as an institution. He educated them alongside his children, which was illegal at that time. He also let his slaves earn and keep their own money. He voted against the Kansas-Nebraska Act which permitted the spread of slavery westward. While President of the Republic of Texas, and later as governor, he refused to permit payment to bounty hunters of escaped slaves and would not allow slave ship trafficking in Texas. He was ousted from office as Governor of Texas because he refused to sign an oath of allegiance to the Confederacy. So this started out about Texas Independence Day and became more about one of the principle characters in the story of how that independence was won. I was also going to write more about how letters and written correspondence helped to document events surrounding and leading up to Texas winning its independence. There is an exhibit later this month, “The Many Marys of Barrington” that is based on “…authentic letters and diary entries” of three women who lived on the farm founded by Dr. Anson Jones, last President of the Republic of Texas. I hope that I've piqued your curiosity enough that you want to do some research of your own and that you enjoy learning more about Texas’ history.